Great news Bear St. Shopper!! The LAST CHANCE 75% Off Sale is here. Our Closing Sale has been escalated to 75% off EVERYTHING and that's super good news for you. We suggest that you consider this to be a limited time offer as inventory is limited (although some items have abundant quantities available). Please also feel free to enquire about bundle deals or inventory levels of your favorite GUND. Please contact us should you wish to submit a Last Chance 75% Off Order. Spanky, Chief Executive Bear (CEB). 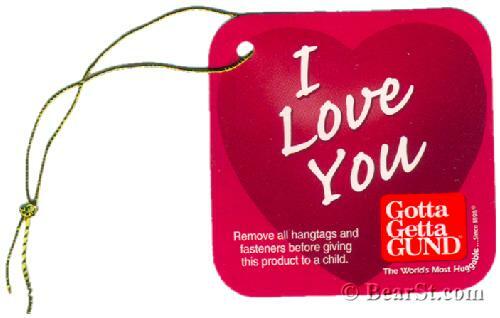 Add this special edition GUND tag to any GUND treasure to deliver your sweet sentiment, again and again. The Whole Shebang - On Sale!